Watching Duke and Syracuse men's teams play each other in the NCAA "Sweet-16" was really interesting, with both teams trying to attack each other's 2-3 zone defense. Several evenings before, a very good Michigan State team had major problems attacking Syracuse's zone. After watching all this, studying it, listening to TV commentators, and taking notes, I came away with some strong opinions on what I now consider key elements in attacking the 2-3 zone defense. I believe now that the most important key is getting the ball into the high-post, "middle space", to an offensive player who can score and make good decisions with the ball. See diagram 1. Good things can happen when you get the ball inside in the green space. I'll detail this below. Don't simply settle for 3-point shots (diagram 1). It's very tempting and requires little effort to just launch 3-point shots, as you can always get a 3-point shot. You must get the ball inside, and you must establish this early in the game. If you can score inside, it takes the pressure off your 3-point shooters. If you can get the ball inside, the defense will have to sag more, and then the outside becomes more wide open. Realize that against the 2-3 zone, you will have to work hard to get those inside shots, and you must be patient. Take the first good shot that avails itself. Sometimes, especially with a shot clock, it's hard to get a good shot. Too often I see a pass go in to the high-post/middle area and instead of the player simply turning and shooting the open short shot, he/she passes it back out or forces a bad pass down low. Pass fakes and shot fakes are very important fundamentals for opening passing and dribble-penetration lanes. Drill this in practice. 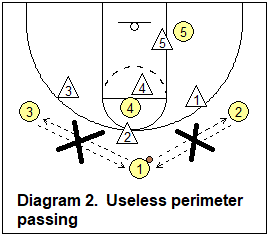 Avoid perimeter "passing around the horn" (diagram 2). We used to think that passing quickly back and forth around the perimeter was a good thing, to over-shift the zone. But in reality, this leads to player stagnation with little player movement and usually fails, or results in someone just jacking up a 3-point shot. We have got to get the ball into that middle area seen in diagram 1. 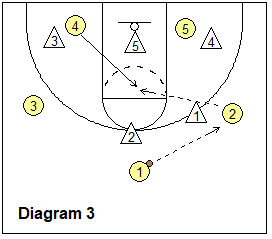 In the past, we have used a 1-3-1 offensive set with a player occupying the high-post area (see these set 2-3 Zone Offenses. But now I believe that instead of having a player constantly standing in the high-post (and clogging the middle), it's better to leave the middle space open, and then attack that space by having your post players flashing there for a pass. A good athletic wing player who is comfortable with the ball in the middle could flash there too. 1. 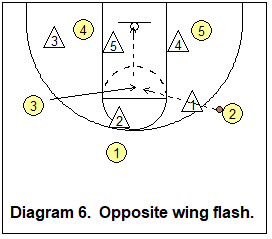 Opposite low post flash and pass from the wing or top. See diagrams 3 and 4. 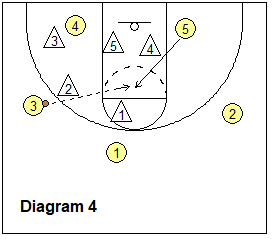 Duke vs Syracuse... low post flashes into the middle space, gets the pass and open shot. 2. 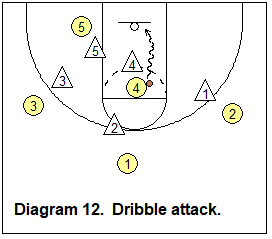 High-post screen and dribble-attack. If the high-post player cannot get open for a pass, he/she could screen either of the top two defenders. 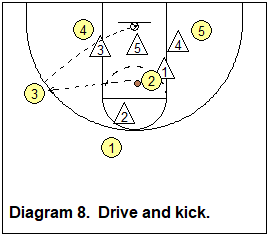 This can result in dribble-penetration into the middle space. See diagram 5. 3. Opposite wing flash. See diagram 6. If your wing player is comfortable here, he/she can flash to the middle also. 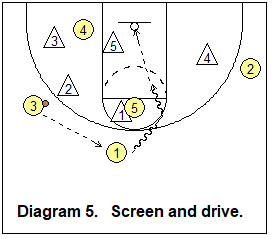 We have two inside post rebounders if he/she shoots here. 4. 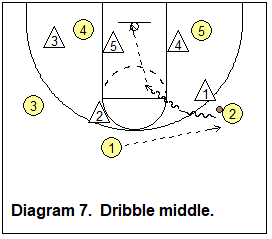 Dribble-penetrate the middle. See diagram 7. Instead to the guard going all the way to the hoop and into the shot-blockers, a nice simple pull-up jump-shot often works great here. Or a dribble-drive followed by a kick-out pass to the opposite wing may be right the play (diagram 8). Duke vs Syracuse... several things in this clip. Duke shows good patience, working for the good shot. The opposite guard cuts into the middle space, gets the pass and kicks it out to the wing, and moves out. Later the opposite low post flashes into the middle spot, but doesn't get the ball. Finally, we see dribble-penetration to the middle, with a pass to the short corner for an open shot. 1. 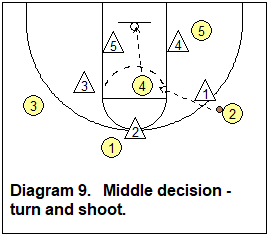 Turn and shoot (diagram 9). This is often the best option as it is a short, relatively easy shot when the shooter is open. Far too often, I see players passing up this shot, and some not even looking for the shot. 2. 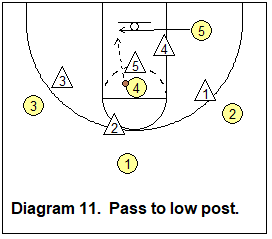 Pass hi-lo to low post (diagrams 10 and 11). The zone defenders will mess up from time to time and the low post will become open. 3. 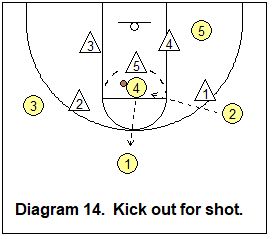 Shot fake and dribble-drive (diagram 12). 4. 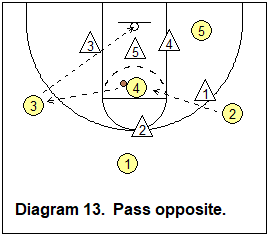 Pass to opposite wing, or to the point, for an inside-out 3-point shot (diagrams 13 and 14). 1. Pass fakes and shot fakes. I'm repeating myself here because they are such important fundamentals. 2. Don't forget that rebounding on both ends of the court is very important, and strong defensive rebounding with the quick outlet pass and an aggressive transition offense can be very helpful, especially against teams that don't get back quickly. 3. 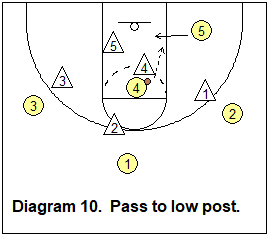 Use of the high lob pass to the low-post. 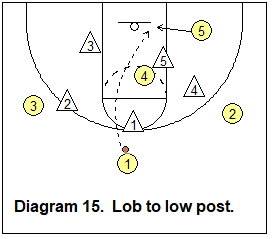 Watching these college games on TV, how often would we see a low post player sneak underneath (baseline) the zone defenders and get a lob pass for a dunk (diagram 15)? You might not have a dunker on your team, but still the lob and a two-handed tip-finish might be possible. 4. 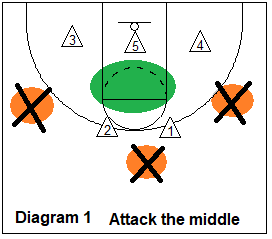 What if the defense brings the low middle defender up, like a 2-1-2 zone? That's OK if they have to adjust to you. You can still get the pass into the middle space, although the shot there might not be open as often, but the hi-lo pass to the low post will be easier. In summary... be patient, work hard, and get the ball in the middle space and usually everything else will fall into place.